In recent years we have seen a trend in growing numbers of young people dropping out of school, university and vocational education which has cast questions over the quality of careers advice delivered at schools. Young Australians face many new challenges; we are living in a time of unprecedented change, a time of cross-industry digital disruption, the influence of global competition on the local employment market from overseas graduates means more than ever before there is a constant need for young job-seekers to up-skill, and to develop enterprise skills simply to remain competitive. 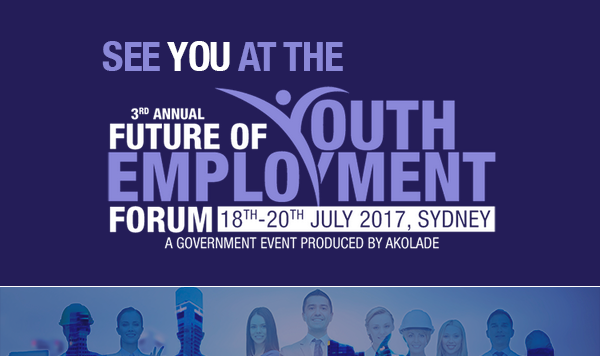 Developed together with cross sector industry, education and youth engagement advocates, Akolade’s 3rd Annual Future of Youth Employment Forum provides attendees with effective strategies, frameworks and execution plans on successful solutions and tactics to effectively combat Australia’s extremely concerning youth unemployment challenge. The forum focusses on a ‘how to’ approach to engage, prepare and support young Australians into work through meaningful and sustainable pathways to employment.